Collins plastics are suppliers of a full range of plastic sheeting. The most common materials are: Acrylic, Perspex, clear Styrene, Lexan, foam PVC, multi-wall Polycarbonate, Acrylic rods and tube, Acrylic capped ABS, wall cladding PVC and profiles, PE Sheet rod and profile, PP sheet. 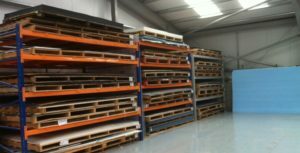 We stock all these materials in a variety of thicknesses from 2mm – 40mm and larger sizes on request. Sheets are up to 3mt. x 2mt. We supply full sheets or cut to size, just saw cut, a flame polished edge, laser or diamond cut finish, whichever is required. Just send us the dimensions you require and we will take it from there.